It's as if they've been stuck with bad karma; that they've been oh-so-close to winning, but some bad karmic event keeps them out of the victory column. But then just like that, the Lehigh offense seemed to have finished with its bad karma, with senior RB Rich Sodeke leading the charge to set up one big touchdown, and scoring the final exclamation point on Lehigh's first win of the season. "After the two fluky touchdowns, the offense finally figured it out and took it to them and finished in the fourth quarter," head coach Andy Coen said to Matt Markus on ESPN Radio 1230 after the game. "It was an excellent drive, all of it coming on the ground except for the one play. It was great to see us finish. We haven't been able to do that. We've had some leads in games but we haven't been able to finish." All the scoring in the game came in bunches, and Lehigh benefited from some fluky plays as well. Up 3-0 with a 32 yard field goal by junior PK Ryan Pandy, Lehigh's found itself with a 1st and goal after junior WR Stephen Sansone ripped an apparent interception away from Cornell CB Del Barnes, allowing Lehigh to set up on Cornell's front porch. Shafnisky snuck the ball into the end zone for a quick score. On the ensuing kickoff, junior FS Randall Lawson hit Cornell WR Luis Uceta, forcing a fumble and allowing senior SS Jason Suggs to scoop the ball and score. In the span of nine seconds, a 3-0 Lehigh lead became a 17-0 Lehigh lead. “That was a game changer,” Archer continued. "We emphasize ball security a ton, and [Lawson] did a really good job taking it away. They made a play there." 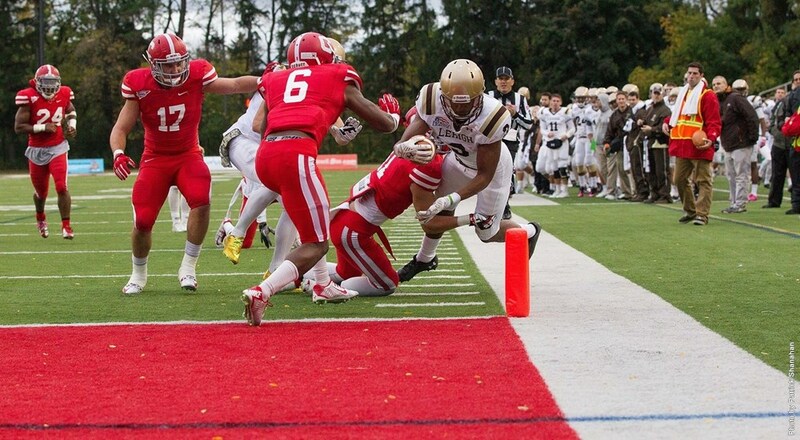 From there, the game became one of field position for both the Big Red and Mountain Hawks, Devine and Cornell P Chris Fraser combined for a grand total of 16 punts, with both Devine and Fraser both notching one punt apiece over 50 yards with the wind at their backs at gusty Schoellkopf field. Several Cornell drives were stuffed by some big play by the Lehigh defense, with senior DT Tim Newton with a big day (2 tackles for loss, 1 1/2 sacks), and an inspired effort by the entire secondary, with interceptions by sophomore CB Brandon Leaks and junior SS Laquan Lambert. Junior FS Randall Lawson stepped into the starting secondary and got 4 tackles, while junior CB Olivier Rigaud added 4 tackles and 2 pass break-ups as well. Freshman CB Quentin Jones added 3 pass break-ups as well. "I though the kids played really well (on defense) today," Coen said. "We pressured them. We got a couple interceptions to stop drives. I thought all of the defensive kids played really well today." As good as the defense was, probably the best part of the game for Lehigh fans was how the offense took charge of the game in the 4th quarter when the score narrowed. Riding the back of senior RB Rich Sodeke for 37 of his 147 rushing yards on the afternoon, Shaf did a masterful job of keeping the ball safe and converting big 3rd down plays, none bigger than a 19 yard pass to senior WR Josh Parris to get to the Cornell 2. Shaf would sneak it in again as Lehigh Nation sighed in relief, while Sodeke would get an very, very well-earned touchdown when the Mountain Hawks forced Cornell to turn the ball over on downs the next play. "It has been way too long, but it feels good to get this win," Coen told Markus. "I'm happy for our kids. We played well today, but there were still way too many penalties and procedural-type things. Obviously it's going to be nice to coach off a win for the first time."